The Nola Single Lever Flex Commercial Style Faucet has a clean, modern design that suits any kitchen dicor. An innovative double spring supports the ergonomic sprayhead, designed to easily switch between stream and spray. This faucet is made with top-quality components in order to ensure superior performance and durability. For easy installation, mounting hardware and an optional deck plate are included. Both simple and attractive, the 2-Handle Laundry Faucet from Glacier Bay combines classic design with practical functionality. The long-reach spout is easily accessible to simplify the toughest of chores, while the 360 degree swiveling capacity provides complete sink access for added convenience. Polished and fresh-looking, this faucet is finished in bright chrome. Uniting simple geometric forms for a vibrant, clean and contemporary design, GROHE Concetto Pull-Out features a solid metal spray and an adjustable flow rate limiter to ensure the potential for maximum environmental efficiency. The handles are each made of solid metal and incorporate a GROHE SilkMove for a lifetime of smooth operation cartridge, allowing users smooth, precise control of the water volume and temperature. At 1.5 GPM, Essence saves on water consumption and comes in scratch-resistant, non-tarnishing GROHE StarLight finish for scratch and tarnish-resistant surfaces for a lifetime of beauty in Chrome Finish. This Hansgrohe kitchen faucet offers remarkable functionality with individual personality and style. Innovative features such as the M2 velvety smooth ceramic cartridge valve. The modern design coordinates flawlessly with any kitchen decor. The solid brass construction is finished with a smooth chrome finish. Bring a modern style with a nostalgic feel to your claw foot tub. Featuring an elegant wide spout, this faucet will look great in any bathtub. Solid brass construction for durability and reliability and a hand held shower. 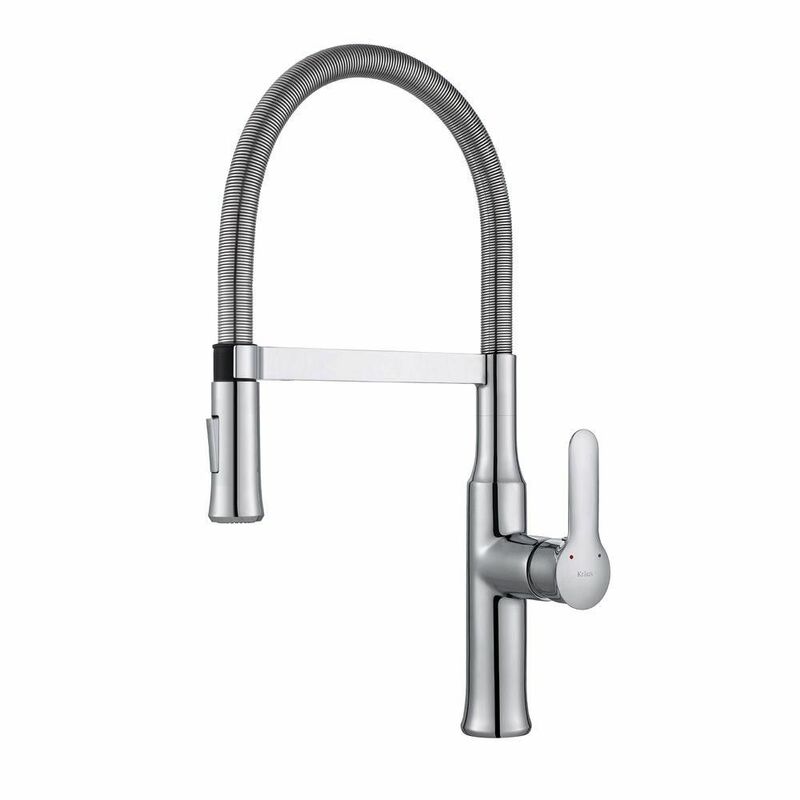 Nola Single-Lever Flex Commercial Style Kitchen Faucet in Chrome The Nola Single Lever Flex Commercial Style Faucet has a clean, modern design that suits any kitchen dicor. An innovative double spring supports the ergonomic sprayhead, designed to easily switch between stream and spray. This faucet is made with top-quality components in order to ensure superior performance and durability. For easy installation, mounting hardware and an optional deck plate are included. Nola Single-Lever Flex Commercial Style Kitchen Faucet in Chrome is rated 4.8 out of 5 by 107. Rated 5 out of 5 by Tori13 from Finishing touch to kitchen remodel High quality faucet and sink combo, it put the finishing touch on my kitchen remodel! Rated 5 out of 5 by Mike from Sleek and sturdy So far, I am impressed. A sturdy and sleek design. Gives a very modern look to the kitchen. Very good water flow, easy to control. Rated 5 out of 5 by State from Great faucet! Great faucet! It looks good and operates really well. Rated 5 out of 5 by KathyK from Great Looking Faucet I love the look of this Faucet. It was easy to install. I find myself keeping up on the dishes just so I can use the spray feature. Just Awsome!! Rated 5 out of 5 by Countygirl3 from I love this faucet, it’s beautiful, and the sprayer works... I love this faucet, it’s beautiful, and the sprayer works independently, it has a push button for the sprayer . Rated 5 out of 5 by Diane 30 from Double sink and faucet Purchased for our cottage because of the good price. We are so pleased with the look and quality that both myself and my daughter are ordering the same models for our kitchen refits at home. There’s no need to pay more! Rated 4 out of 5 by Gayl from Faucet extender? The faucet is beautiful, I have just finished installing it so I haven't used it yet. But there is no explanation for the faucet extender. The instructions should state how and when it should be used.